Problem Types define the type of work that is being requested. Problem Types give you a way to track and report on the general types of work your IT department is doing. (Example: Audio/Visual, Computer Services, Laptop, Email, etc.) Incident has a predefined list of Problem Types and you only need to activate the ones that apply to your IT operations. 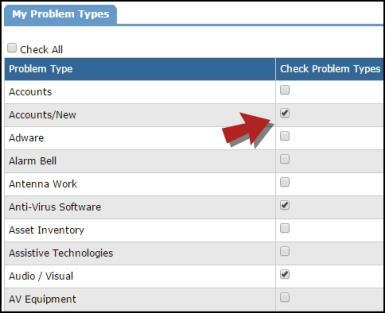 Click on the Problem Types tab at the top of the page. Hover over the Shortcuts menu and click Manage. This brings you to a list of the available Problem Types with checkboxes beside each one. Check the boxes of the Problem Types you want to activate for your account. *Note: We recommend activating a few basic Problem Types to start. It is easy to activate more later on, but it is more difficult to remove Problem Types after they have been in use. Your Problem Types can be used for much more than just designating the type of work on your incidents. They can be used in automatic routing to send specific incidents to specific users. For example, you could set up the system to send all Laptop Problem Type incidents to a particular technician, while all Printer related incidents go to another.